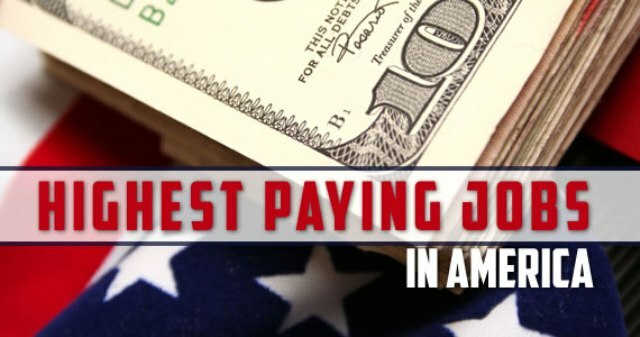 Highest Paying Jobs in America. America is often referred to as the Land of Opportunity, and indeed the country is known for having some extremely high paid jobs. While there are employment opportunities in all sectors, if you are looking for work in the United States, you may be interested in knowing what the highest paying jobs in America are. Here is a list of some of the career paths with the highest grossing salaries in the land of Stars and Stripes. Of all the high paying careers in America, many of them are within the field of medicine. While general practitioners can command reasonably high salaries, some of the best paid people in the country work in the specialist fields of anesthesia, obstetrics, gynecology and oral and maxillofacial surgery. All of these disciplines attract salaries of over $200,000 and are among some of the most sought after positions in the country. Of course the salary is commensurate with experience, as all of these roles require considerable experience in the industry as well as extensive educational qualifications. Education to degree level is the bare minimum, with the majority of these positions demanding higher qualifications such as a master’s degree or doctorate. Having a beautiful smile is extremely important to Americans, and therefore it is not surprising that the field of orthodontics is one of the highest paid careers in America. Commanding salaries of around $180,000 per year, orthodontists specialize in correcting anomalies in the oral cavity. To secure a role in this sector, a lot of experience in the industry is necessary. Usually, successful candidates will have completed four years of college followed by no less than five years of training in this specialist field in order to have reached the level of skill necessary for this job. The field of engineering is generally a lucrative one in most of the world, however the specialist sector of petroleum engineering is especially attractive thanks to its high salaries. Employees working in this industry can expect to earn around $150,000 annually, but will have to undertake a significantly responsible role. Petroleum engineers are charged with devising new ways to improve methods of gas and oil production and must be able to efficiently manage staff and resources. As you would expect a high level of technical skill is required for this post, with the majority of roles necessitating successful completion of a three or four year degree course as well as a minimum of two years experience in the industry. America is often referred to as a litigious society, so it makes sense that lawyers in all fields are much in demand. Representing clients in both criminal and civil cases, it is possible to either specialize in a single field or offer a more general practice. Salaries can vary between sectors, regions and individual firms; however those who work for the most prestigious companies can expect to earn around $130,000 a year. Extensive educational qualifications are necessary to obtain a position as a lawyer in the United States - at the minimum successful completion of a degree course. Many firms also requires their employees to have undertaken further study at Masters level, and to achieve the highest level salaries, a minimum of five years of experience is necessary. An exciting and aspiration career path, the role of an airline pilot is a very responsible one, but the high salary is more than worth it. Commanding pay scales of up to $120,000 a year, top airline pilots not only enjoy all the benefits of exploring the world but also enjoy an excellent standard of living. To secure a post as an airline pilot, many candidates will have completed a four year bachelor’s degree. They will also have undertaken specialist training and will have obtained the obligatory commercial pilot's license as well as the Airline Transport Pilot certificate.